Green is the most beautiful color that is mentioned ten times in the Holy Quran and in some verses the Elysian people’s green fittings and green silk clothing in the Paradise are also mentioned. The color of green plants is also repeated several times. Green brings happiness, content and pleasure. It stands for growth, existence and life. Based on psychologists, green is one of the most relaxing colors which symbolizes life, growth and immortality. (Nasaji Zavare, Ismail, Green, the color of belonging, comfort, lessons of Islamic School, Q 48, No. 8, p. 2). Green is the color of patience, forbearance, tolerance and stability. It is strengthening, eye-catching, and relaxing. Imam Kadhim (PBUH) said: “Three things brighten eyes [and in another version, three things remove the grief] to look at plants, flowing water and a beautiful face (Majlisi, Bihar al-Anwar, vol. 104, p 45, H-10). Green is made of mixing yellow and blue and it is a moderate balanced color; neither like yellow which is arousing and exciting nor as blue is that tranquilizer, passive and cold. This color represents stability and self-belief (Luther, Colors Psychology, p. 83). Green symbolizes faith, perfection and is the color of the Heaven and since it represents faith and confidence, it is considered sacred by Muslims and people link this color with the Holy Prophet and the Imams (the Ahl -al-Bayt). (Aboutalebi, the Symbolic Meanings of Colors, Page 125). The Holy Quran focuses on this color and refers to it seven times as the color of the plants and vegetables on the earth, and considers it as a sign for believers, as this verse: “Do you not see that Allah sends down water from the cloud so the earth becomes green? Surely Allah is Benignant, Aware.”(22: 63). Most parts of the earth are covered by green vegetation, such as forests, pastures and orchards. These colors work wonderfully to soothe the souls of humans and animals, and according to the different hadiths, looking at plants remove one’s griefs. God introduces the nature and the green plants as the manifestations of joy and happiness. “Then we caused to grow thereby beautiful gardens” (27: 60). In defining the word “bihjah” (beautiful), Raqib Isfahani said: “Bihjah is the beauty of color and the revealing of joy in it”. Gardens are green and according to the Quran the green gardens are joyous. This verse may refer to the joyful effect of green and reveal scientific miracles of green in the Holy Quran. Professor Paknejad also, referring to the same verse, interprets it as the miracle of the Holy Quran. (Paknejad, the same, Vol. 5, P.157). Green in the Holy Quran is the color of the Paradise and people in it. It beautifully depicts the green clothes and carpets and upholsteries in the paradise. Paradise is the eternal and relaxing place and home for its people, so it is comforting for them in every respect; even the type of colors used in Heaven. That’s why the color of Paradise, its people’s clothes and fittings is green. The Holy Quran represents in one case, the color of Paradise “Mdhamtan” in Surah “Al-Rahman” as the two paradises that are fully green and in other two cases, the color of clothing of those in heaven and in another case their thrones as green. “And wear fine green silk of thick and thin “. (18:31); “While the residents (Paradise people) are leaning to the green pillow and beautiful unique carpets. (55: 76); “Above them there are thin silk and thick silk” (76: 21). According to these respectable verses, the Prophet (PBUH) sometimes used to wear green clothes. It has been quoted that he liked green clothes and had a long garment of green silk. Al-Ghazali says in Ahya-ol-Olum: “The Prophet liked green clothes and had a silk garment that when he wore it the green color was so beautiful with his bright face” (Tabatabai, Sonan-al-Nabi, p. 174). Green symbolizes the eternal life of faith and perfection and that has been best represented in heaven. The verse 64 of al-Rahman chapter of the Quran says: “Mdhamatan”. It shows the intensity of green, to the extent that it has somehow become dark. (Tabatabai, Al-Mizan fi Tafsir al-Qur’an, Vol 19, p 125) and that is attributed to the two paradises explained in Al-Rahman. The complement for green is red (Pauline Wales, Colors and Effects, Therapeutic, p. 105). In Surah Al-Yasin, God mentions the redness of fire together with the greenness of the plants. “He Who has made for you the fire (to burn) from the green tree, so that with it you kindle (fire).” (36: 80); Green here represents affluence and abundance as Prophet Joseph interpreted the seven green clusters to seven years of abundance. The part of the verse 60 of Surah Naml that refers to the delightfulness of the green gardens can be another scientific miracle of the Holy Quran. After naming some effects of color green such as tranquillizing, balancing every aspects of the human personality, relaxing the nervous system, cooling blood and treating high blood pressure Professor Paknejad says all these aspects have been indicated in the verse 60 of Surah Naml and in the hadith by Imam Kadhim which is mentioned above. (Paknejad, the same, Vol. 5, p. 157). 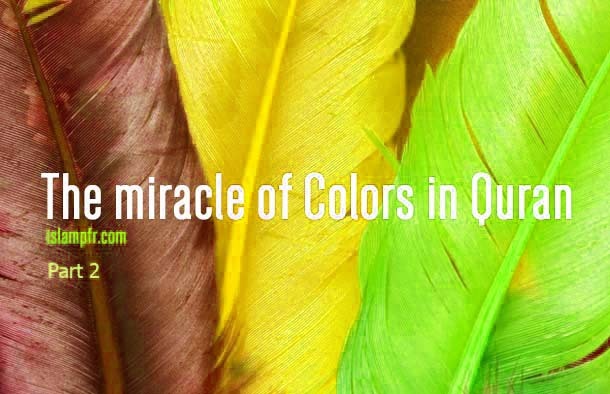 By all references to the Holy Quran and also the scientists’ researches it is clearly understood that green is a delightful color and a sign of God’s creation and it implies the Divine Unity; since the same God who created man, also created the lavish beautiful joyous nature for him, and there is endlessness, connectivity and order in the entire system as well as coordination between the individual components of this system which implicates the existence of a unique and wise creator. what is exactly your question?